Give me a tour, I'll take it. 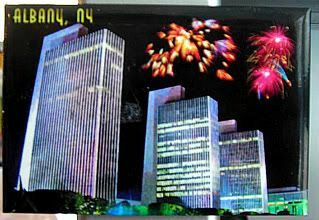 This magnet's from a train trip up to Albany - the Empire State Plaza, where they give free tours. Designed by the same guy who did Rockefeller Center, the plaza was built mostly by Governor Nelson A. Rockefeller, who wanted a capital that the world would remember for all the ages. It's basically NYS's base of government operations, and sits on like 100 acres of land, with like a dozen buildings - including a funny-looking performing arts venue whose giant egg shape is just like alien ship right out of Doctor Who. The cool thing about the complex is that - just like its sister Rockefeller Center - there's a maze of underground passageways that connect pretty much all of the buildings together. Which means, you can drive to work, park your car, and never even see the outside until the drive home. How awesome. If you're ever killing time.